A print compilation and real-time performance reflecting the contemporary relevance of the media theorist and philosopher Walter Benjamin. The structure of facebook as a social networking tool and magazine with decentralized notes, essays and media publications, in a mixture of private and public statements coming from all kinds of content fields, enhanced the concept of short daily updating and interactive communication to collectively create an associative publication on life and oeuvre of Walter Benjamin. Benjamin described as the Angelus Novus: the space where past and future coincide and where not ideas shape presence but where presence emerges. 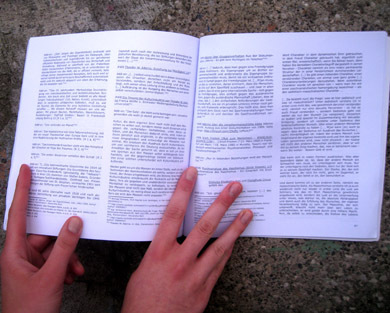 In the years 2010-2012, Alexandra Reill developed a trilogy of interactive media enactmens reflecting the contemporary relevance of life and oeuvre of Walter Benjamin, Hans Richter and Bertolt Brecht in an information age digitizing itself in manifold ways and at the same time struggling with turbulent economic difficulties. Besides Tribute to WB, Alexandra Reill will present also two more pieces from her interactive trilogy: Tribute to Hans Richter and Blessed Simonida. Moldau who was forced to flee with his family from Nelkengasse in Vienna in 1938.
honouring life and work of one of the first filmmakers. 2012 Blessed Simonida from the Brilliant Grounds: interactive real-time performance, following Brecht’s Saint Joan of the Stockyards. 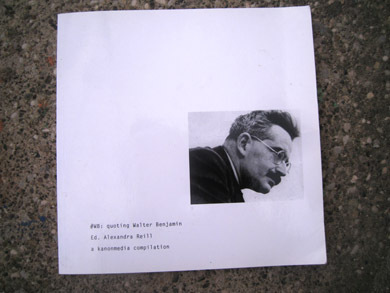 2009-2010 / 2011 – #WB: quoting Walter Benjamin: publication and participative media performance reflecting the relevance of the media theorist and philosopher Walter Benjamin today. 2008 / 2009 / 2010 – Would We Say No? : communication project in the streets of Vienna reflecting attitudes toward work in fascist times and today. 2008 Home Sweet Home: documentary film on [auto]biographic tracking of fascist traces in four post-war generations of a “majority society” in Vienna. 2006-2008 – Art Following the Trend? Artists′ Voices: interviews, publication and a study on the functions of artists in society. Sinti in Vienna. Several experimental short films and interactive installations on time and space. 2001 – S.P.I.N.Y., an interactive feature film on CD, first production of this kind funded by MEDIA in Austria. symptom of contemporary conditioning, Deserts & Backbones: documentary film on religion and free will. 1985-1995 set and costume design for stage and film.